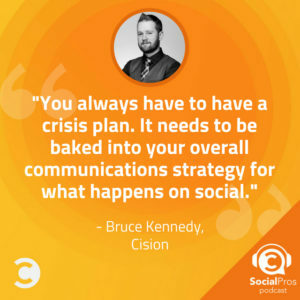 Bruce Kennedy, Social Media Manager at Cision, joins the Social Pros Podcast to discuss the current state of PR and crisis management. There was a time when news cycles were long enough to afford businesses a little bit of time to gather and respond to a crisis. These days, however, with the constant connectedness of consumers and the nearly real-time unfolding of news on social media, the only way to respond well is to have a plan. According to Bruce Kennedy of Cision, your crisis response plan needs to be an integral part of your overall social media strategy. Many of the features that have become available to businesses on various platforms, such as increasingly powerful analytics and the ability to live stream video, can benefit your crisis plan. Analytics help you see what comments and posts are gathering attention, allowing you to prioritize your response and stop a potential crisis before it happens. Similarly, live streaming video allows you to respond in an instantaneous and personal way while also providing immediate feedback as to how your message is being received. By incorporating these ideas into your crisis management strategy, you can more effectively respond to any current crisis, prevent potential troubles, and ultimately help your business stay on a path to growth and success. How to stay relevant in PR. Why Twitter is still the biggest social platform for PR. How content creators differ from traditional journalists. Why crisis planning is mandatory. How analytics have helped businesses prioritize responses on social media. How Facebook Live has changed crisis management. There are a lot of resources, but ultimately, you have to just get out there and do the work! As a huge fan of stand up comedy, Bruce would love to speak with Dave Chappelle about his creative process and the way he is able to present controversial material that cuts right to the heart of an issue. Jay Baer: Hey everybody. This is Jay Baer from Convince & Convert, and this is Social Pros, the podcast for real people doing real work in social media. I am back, back today with my special Texas friend. 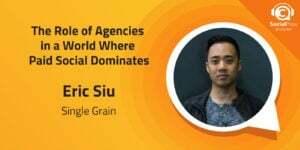 He is the executive strategist from SalesForce Marketing Cloud. We've been apart for multiple weeks on the show because it's summer and people are doing stuff. Mr. Adam Brown is here. Adam Brown: Jay, I've missed you. It is so great to be back on Social Pros with you. And it was a great show today to start the fun again. Jay Baer: Yeah. It really was. You think about, it's easy to forget the impact that social media has had on how we communicate, the impact that it's had on the traditional media. It wasn't that long ago that media just wrote stories in the newspaper and TV and radio, and that was the deal. Now social, Twitter in particular, is oxygen for communicators and for media. And our guest this week, Bruce Kennedy, who's the head of social media for Cision, is right in the middle of that maelstrom. Adam Brown: He really is. And one of the things I like about Cision, and one of the things I like about this podcast is, you've spent time in PR. I've spent time in PR. A lot of our listeners have been PR practitioners and are very familiar with Cision. But a lot of them maybe not even have heard of this, and recognize the tools that publicists and communicators use to help connect them with journalists and content creators and influencers. And that's a lot of what Cision is about. And what I think Bruce has really done a great job on this show talking about is how they, as Cision, are almost using and eating their own dog food to promote and market their products. Jay Baer: Absolutely. Also, also a really nice section in this podcast about how modern crises unfold in social media and how you can prepare and arm your organization if something untoward were to happen and you get into a Twitter backlash. 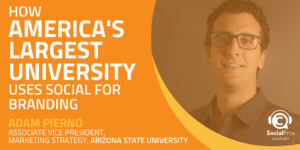 We talk about that as well, and in addition, some global communications issue too, how to use social media outside the US, and a section on employee advocacy, how to use social to amplify the thoughts of your own team members. So we cover a lot of ground in this episode. You're going to love it. Here comes Bruce Kennedy from Cision. Hi. 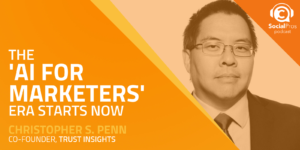 It's Jay Baer, and this week's episode of the Social Pros Podcast is brought to you by SalesForce Marketing Cloud, who have a complete guide for B to B social media marketers that you can download right now. We'll show you the best types of content, the best time to post content, the best channels to use, what kind of metrics to use. It is super comprehensive and absolutely free. Go to bitly/socialb2bguide. That's bitly/socialb2bguide, all lowercase, to download it right now. It's from our friends at SalesForce Marketing Cloud. Also, the show this week is brought to you by our pals at TechSmith. I use TechSmith tools all the time, Snag It and Camtasia. With tools like these, anybody can create custom screenshots, screen casts, videos. If you're trying to merchandise your results internally and show your boss how great you are at social, you can be using a lot more visuals that you're using today. If you need marketing videos, but you don't have a production team, Camtasia is for you. It's for folks who don't have video experience. Communicating with visuals is more important than ever. Camtasia and Snag It make it easy. Go to techsmith.com/socialpros. That's techsmith.com/socialpros to learn more. Thanks so much. 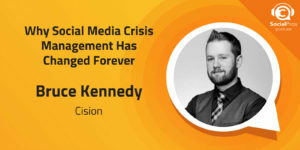 Bruce Kennedy, social media manager from Cision is our guest this week on Social Pros. Bruce, how are you? And thanks for being here. Bruce Kennedy: Doing great, Jay. How are you? Jay Baer: Living the dream. Now tell the folks at home, all of our many tens of thousands of listeners, and thanks [inaudible 00:03:35] everyone, by the way. Tell me what Cision actually is because it is like a crazy collection of stuff now. I mean, you guys have gotten so big. Jay Baer: It is an amalgamation. Yes, Adam Brown. Folks who may think of Cision as a media database, and it is still that. But you also do a lot of other stuff, social listening, influencer ID, et cetera. Give us a little description, if you would, please. Bruce Kennedy: Yeah. The idea now is that we are an earned media software stack. So anything that your coms department would need to do top to bottom, you can log into the Cision communications hub and do. That covers some of our more traditional products like media database, or press release distribution, down to everything from insights and analytics and tracking conversion events on your website and things of that nature. Jay Baer: Talk a little bit more if you would about Cision insights because I've had the chance to do some work with Cision. And that's a pretty special product. That ability to kind of make earned media measurable in a way that it really hasn't been historically is pretty cool. Can you talk through that a little? Bruce Kennedy: Yeah. Definitely. As you probably know, Jay, my background's in PR, so this is something that's exciting to me because the idea behind Cision insights is to get the PR department the same analytics that the marketing department, advertising department have been working with and using to get the lion's share of the budget, historically. The way that it works is, say if you have a mention in the Wall Street Journal, for example. And Cision's media monitoring picks that up, in our system we assign a tag to that, that's similar to a cookie. We do an information exchange with advertisers who have the demographics and firmographics for those particular pages, like the Wall Street Journal. They have all the ad information for that. And then we funnel that into our system. Traditionally, if you've been mentioned in a tier one publication, you might look at readership or unique monthly visitors. Now you can look at how many people read the exact article that you were mentioned in and what actions they took after the fact. Adam Brown: Bruce, it has to be interesting to work in PR and marketing and social as social media manager for Cision in a company that helps companies, well, with their PR marketing and social media. Do you believe there's kind of an expectation that what you're doing in terms of marketing and promoting Cision really has to be at the top of your game, because in a way you're demonstrating the value of all of your technologies, the values of your processes, the values of your consultancy. Bruce Kennedy: 100%. It's interesting because my background in PR, I think, lets me speak to our customer issues and speak to our potential customers in a way that really makes sense to them because I've been in the same position. For a prospect, for example, I've been in a position where I'm trying to get more budget for an agency that I work for. I'm trying to get more budget from the CEO to invest in a product like Cision, because I've done that during my PR days. And then the same thing with the customer service side of things. The exact same complaints people tweet at us are the exact same complaints that I had in the past. So that background and being able to address those things is really helpful. Adam Brown: One of the things that Jay mentioned in the opening is how Cision has grown through as we call it an amalgamation, but a lot of mergers and acquisitions of companies that, just like Cision proper, have been focused on assisting marketing communications PR people in their activities. So by definition, they're going to be doing a lot of social media activities on their own. How do you kind of reconcile all that? How do you wrestle all these social media practitioners that are wanting to do their things, but recognizing that you've got to kind of have one vision, one brand, for Cision? How do you gel all of that together? Bruce Kennedy: I would say there's two things. One is just communicating a lot internally and making sure we have documents that outline our tone of voice, cadence, brand guideline, stuff like that. That's definitely a big part of it. The other one, I think the way we approach content helps with this a lot. For example, a brand like PR Web, that customer is always going to be looking for content around how to create the best press release. But that doesn't necessarily feed all the way up into the Cision story that we're trying to tell as a technology stack. What we try to do is, whenever we preview, say here's three tips on how to write a great press release headline that's going to get engagement. We try to funnel that up into what the communications cloud as a whole can do, and preview the types of analytics that ... You take the point solution and you can talk about that on its own. But then you also talk about how it fits into the stack. Adam Brown: You noted that you are kind of a PR practitioner. That's your background before joining Cision, which probably makes you a lot like Jay and I, that sometimes when it comes to marketing and PR activities, we're our biggest critic. And I'm curious if you've found that promoting Cision to marketers and communicators is harder because everybody's their own critic. And do you have any tips for how, when you're trying to reach not necessarily just the journalists, but the people who are also trying to reach those journalists and stakeholders and practitioners? Any advice you can give to our listeners? Bruce Kennedy: Yeah. One of the biggest things for me is staying active in the PR world. You go from agency life to in house, and you might switch roles like I did from PR to social media. And you kind of run the risk of, you've been out of PR for five years, but you keep telling everybody the same advice thinking that customers have the same problems. So one of the best things you can do from a social perspective is just ask. Try to have as many conversations as you can. 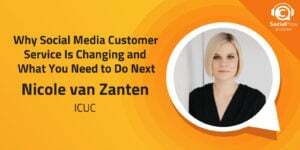 We host Cision chat every Thursday to try to have an open dialogue with our customers and users on social media, even if they're not customers, just to hear: What's your biggest challenge in public relations today, or marketing, or social media? So that we can really stay kind of ingrained in those issues. Jay Baer: What time is Cision chat on Thursdays, Bruce? Bruce Kennedy: 2:00 PM Eastern time. Jay Baer: 2:00 PM Eastern, ladies and gentlemen, Cision chat, hashtag Cision chat. Tune in for that. Speaking of Twitter, I know that Cision is active in the pantheon of social channels, of course. But Twitter still is a really important channel for you. And I presume that's because journalists tend to over sample in terms of their use of Twitter, therefore public relations and communications practitioners also use Twitter more. So if we said, "Hey. Here's a cross section of a different brand," somebody else that has been on the show, it seems to me that you guys put more emphasis on Twitter than a lot of other brands. And it's because of the composition of your audience. Yeah? Bruce Kennedy: Yeah. That's exactly right. And it's driven by media taking to Twitter first, so PR, coms, professionals, anyone who's trying to connect with media follows. So that's where we end up spending a lot of our time because that's where our audience is. Jay Baer: Do you think that'll ever change? I mean, you see LinkedIn as, I think, ascendent would be an appropriate word for kind of their role in the B to B consciousness right now. You see people putting more attention in LinkedIn, creating more videos on LinkedIn, et cetera. Do you think we'll ever find an era where journalists will start to use LinkedIn or maybe something else more so than Twitter? Bruce Kennedy: I could see. If anything, I could see it being LinkedIn. I don't know if more than Twitter, at least as much. One of the things with that, think there's a huge opportunity on LinkedIn for content creators moving forward with LinkedIn. LinkedIn was slow to get a lot of variety in the types of content you can post. They're just now ramping up video capabilities and things like that. And I think that sort of lack in what they've offered in terms of the types of content you can put out is why the adoption there has been a little bit slower, but that's definitely the one we're keeping the closest eye on in terms of growth. 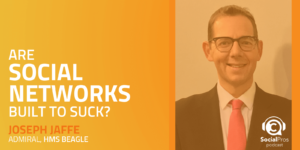 Jay Baer: Some folks who are listening to Social Pros may not know that Cision owns HARO, H-A-R-O, Help A Reporter Out, which was a sort of bidirectional news sourcing email originally created by former Social Pros guest, Peter Shankman. And it's sort of its own kind of community and its own sort of brand. Can you talk a little bit about how HARO works, for folks who aren't initiated, and then also how you use social to sort of promote and propagate that particular Cision function? Bruce Kennedy: Yeah. Help A Reporter Out is a pretty simple product. If you sign up for it as a PR pro, you will get email notifications that have a list of journalists and stories that they're working on, and they're looking for a source. So on the other side, journalists sign up. They say, "I'm working on a source about paying off student loan debt for USA Today," and then they put that into a query. And communications professionals can pitch people they have to speak on that story. And then in terms of what we do on social for that, there's a lot of back and forth with our customers on social there. It's actually really engaged channel, especially on our Twitter. And we tweet on the hour, updates with hashtag urgent HARO request, so that we're sharing that content on Twitter too. So if you're following us on Twitter, maybe you didn't see the morning email. You might catch, there's a journalist looking for this type of source, and be able to reply to it right there. Adam Brown: In a way Bruce, you're kind of like an idea matchmaker. I mean, you're trying to match up all the journalists. I've always found that an interesting and novel concept. To that point, one of the things I think we're all recognizing is that the whole idea of what a journalist is and does is being defined and redefined. We even, here on this podcast, are using the word content creator and things like that. What's the difference between a journalist and a content creator and the like? Your world in terms of Cision has primarily been that journalist, that traditional journalist who typically is writing a script or writing an article. Probably went to J school, all the traditional trappings of a journalist or media reporter. As we're seeing that kind of audience change to be more content creators, are you also finding that some of those content creators are potential, or likely, or even active customers of Cision and all of your services? I'm just curious how all that's kind of evolving today. Bruce Kennedy: Yeah. There's definitely an overlap between our customers and then content creators and influencers. Even some influencers who are more social media focused want to get in front of traditional journalists, so they might use a product like Database. Content creators might use a product like PR Newswire or PR Web to distribute a piece of content and bring more eyeballs back to it. So there's definitely a lot of crossover there. Adam Brown: What aspects do you find a content creator focusing on as compared to a traditional journalist? Are content creators just looking for sheer publicity? Are they searching for story ideas? Are they obviously trying to all promote themselves in some, way, shape, or form, or promote their work product? What differences do you see kind of in those two audience groups? Bruce Kennedy: Yeah. There's a lot of differences that come up. From terms of pitching those people if you're trying to work with them on behalf of your marketing team, obviously influencers. There was some confusion for a couple years over that, and what an influencer partnership looked like. But now it's pretty widely accepted that that's expected to be a paid partnership. So that definitely brings in some difference there. It almost makes the traditional media side of things more difficult than ever because a lot of brands look at, say, an Instagram influencer or a blog influencer, for example. They have a set price right there on their website. They know exactly what they need to do to start working with that person, whereas you see a reporter who works at the New York Times. And you can spend years trying to get on that person's radar without knowing exactly what they're looking for, doing so successfully. Jay Baer: Yeah. It's interesting. It's like we've paid public relations professionals to sort of be that conduit, whereas for influencers, you just pay them directly, and sort of cut out the middleman, the same way that Trip Advisor, or the same way that Expedia cuts out the travel agent middleman. Jay Baer: Or Charles Schwab online cuts out the stock broker middleman. I hadn't thought about it that way until you mentioned that, but it's an interesting set of circumstances. Bruce Kennedy: One of the cooler things that we've done recently that I really like is, we've been mapping social media profiles for traditional journalists back to their contact information within the database. And what that can do is, say you have a reporter who works at Tech Crunch, and they cover startup funding. You might notice, if you look at it in the Cision communications cloud, you might notice that he tweets every single day about Star Wars, and he's listed as being influential on Twitter about Star Wars. That doesn't mean necessarily that just mentioning Star Wars to him in an email is going to guarantee you get placement. But it does give you some background information based on, so this is the traditional journalist, but this is what he's influential in on social media. And that can give you some hooks and ins to craft better pitches for that person. Jay Baer: That's interesting. That's a cool angle. What do you think about activating the employees at Cision? It's a big company. You've got a lot of people working there now all over the globe. How important is employee advocacy and sort of getting your team members to talk about the company or to share potential pieces of content? You guys do a lot of research projects and things like that. How much is sort of turning those team members into influencers on behalf of the organization part of the strategy that you're employing today? Bruce Kennedy: It's definitely part of the strategy that we're employing today. Whenever we have internal company emails, we're always sharing click to share options with that and encouraging people to share a product update or share some sort of company news. And we have an internal social network that we use as well to kind of share information about exciting things going on throughout the company, which is great because that can kind of organically create content that people will share on actual social media. If it's a congratulations to an employee who did something really great, sometimes we'll see that spill over into traditional social media, even though it's an internal network. And then also, I'll source that for content. Bruce Kennedy: Yeah. If there's something, someone's 10 year anniversary, or whatever they're celebrating in the Albuquerque office, I might never hear about it if I don't catch it on Yammer, which is our internal social network. But it gives you great content to share there. Adam Brown: That's a great idea because I'm assuming, just like you, a lot of that people at Cision come from PR, marketing, advertising types of backgrounds. And they're going to have such a great network of perspective customers or active customers. Bruce Kennedy: Yeah. It's definitely something I think we need to do more of moving forward and kind of look at some new ways to activate and new ways to encourage people to share. It's definitely something we're looking at doing more of, but it's been something that ... It's also had a part of our strategy for a long time. Jay Baer: We're at this place right now societally where there's a lot of brand backlash incidents. Right? A brand makes some sort of a misstep, perceived or real, and the natives grab the digital pitchforks off the wall real quick. Right? And so a crisis dusts up very, very fast. And companies are held to account in a way that would've been unthinkable 15 years ago, really weird 10 years ago, even 5 years ago. When I was writing books about social crises, the speed and the ire and the viciousness of that kind of backlash just simply wasn't there. As an organization that helps companies kind of think through and do social listening and say, "Oh my God. We have a problem on our hands. Press the red button." What do you think about that? Where does this lead? What's the end game here? Is it that everybody has to have the "social media war room"? Adam does a lot of set ups of those for big brands. He's amazing at it. Is that where we're headed? Or is there some other conclusion to draw from this? Bruce Kennedy: I think, unfortunately, it is a bit of where we're headed. I think you always have to have a crisis plan now. It needs to be baked into your overall communications crisis plan strategy for what happens on social. And one of the interesting things about social media is those crisis communication plans have to be a lot more specific because if you put out a press release about some sort of crisis, some brand crisis, and you make a statement on it, whatever you do, you don't get the type of immediate questions where people start trying to poke holes in things like you have on social media. You have a very savvy audience there, and those types of those war rooms have to be a lot more active now because they have to be anticipating. Okay, if we say X, our audience is going to ask why. And we need to be able to answer that. Jay Baer: You've got to think it through more so in advance, almost your own internal FAQ. Bruce Kennedy: Right. It's almost like you have to come up with your crisis messaging, and then have the red team, someone who goes through and tries to poke holes in it. Jay Baer: Interesting. More of that desktop, let's play this out, role playing. Adam, did you find that in the stuff that you're doing at SalesForce and helping brands think this through? Adam Brown: I think so. One of the things back from my PR days was how we helped customers and actually did mock crises events. We would pretend. And I'm going to show my age here, but we would parade into the headquarters of a customer and pretend to be 60 Minutes. You know, Mike Wallace and the camera and the microphone looking for the spokesperson to ask them the questions. And that would be how we would start a one day or half day training session. And that was appropriate because you only had that amount of time to deal with a news cycle, or maybe two news cycles. But as you said, Bruce, today the news cycle is measured in minutes. And you've got to be so ahead of the curve. And I think that's where tools like Cision can help to be able to understand. Who are those go to people that you need to reach to quickly? And then tools like our tools from a social listening standpoint with social studio, or the sprinklers, or the spread fast, the brand watches, et cetera, can help be that early warning radar to help you kind of predict and see when something's coming down the pike because you're going to have to respond to it quickly. Bruce Kennedy: Right. One of the things I find fascinating is that as those tools have gotten more advanced, brands have gotten less knee jerk in terms of how they respond to stuff. Without those tools, somebody would say something on social media and you have no idea whether it's picking up traction. A lot of these things you can monitor in real time now and get alerts. So I feel like you see a lot more of brands not putting their foot in their mouth by responding to something that they probably didn't need to respond to or respond so thoroughly in the first place, which is a nice change of pace because I'd say about five years back in social media, there was this prevailing thought that you have to reply to everyone even if they're being completely unreasonable, which there's still something to be said for that. But I think brands are more relaxed on what they feel they have to do in that regard. Adam Brown: Kind of to that point, one of the things you talked to us a little bit in the pre show was around something that you're excited about, and that is that brands are taking chances in social. Maybe not around issues and crises events, but you mentioned for example, Wendy's being edgy, and brands like REI and Patagonia that are taking political stances. And I'm curious to have you elaborate a little bit on this. In a way, is this companies like REI and Patagonia just trying to break through the clutter and try to do something that's a little bit sensational? Or is this more about a shift in how brands are starting to market themselves to individuals who are more interested in a brand's stance on political and sensitive subjects. I'm curious kind of what you feel kind of from where you sit at Cision, working with many of these marketers and communicators and agencies. Bruce Kennedy: I think a lot of it has to do with the better data and better insights and better understanding that people have of their audiences now. I think that helps brands like Patagonia and REI, for example. You can look into social, political leanings and things like that through social media now. And I think that just knowing their audience really well helps them be able to take a stand on an issue and say, "Okay. I think how we feel about this particular issue aligns with most of our customers. It's actually going to make them more loyal customers moving forward and identify more with our brand. And the percentage that's going to be upset by something like this isn't going to have as much of a negative business impact as that sort of positive, that customer loyalty and really sort of feeling on the same page with a brand." And I would say the same thing for brands who are a little more edge, like Wendy's. Or Gushers is great example. If you follow Gushers on Instagram, they have a hilarious feed where it's just like tacos full of Gushers and weird things like that. Adam Brown: We've got to check that out. We've got to link that up in the show notes. Okay. I'm opening up another window as we speak. Jay Baer: The team that is listening to this, remember Gushers on Instagram. Okay? Bruce Kennedy: Yeah. I think they've realized their consumer who's on Instagram is going to find that funny and want to follow that content. The Gushers consumer on Instagram isn't going to be interested in the nutritional benefits of Gushers, or a scientific study on how eating candy makes you happier or something like that. They've really dialed in that content. While it might seem more risky than ever, I think it's actually calculated in a lot of ways. Jay Baer: Well, and it's also consistent, which is one of the things that brands are not particularly good at, especially on Instagram. I find that sort of a random collection of photos, like your grammy's scrapbook, doesn't typically work on Instagram on the brand side. Yeah. Even if it's unusual, at least people know what to expect. Right? They can tune in. On a similar topic, I wanted you to weigh in before we get to your background, on the use of Facebook Live and real time social to fight crises. There's been some good examples of brands just turning on the camera and saying, "Yeah. We messed it up. Here's what we're going to do about it." Do you feel like we're going to see more of that? Or is that something that is too risky for most brands to jump into? Jay Baer: A fauxpology I called it in a [crosstalk 00:28:07]. Adam Brown: Oh, that's good. Bruce Kennedy: Right. Yeah. The, we're sorry you feel that way about this. Jay Baer: Yes. If you're offended, we're sorry. That's the good one. Bruce Kennedy: Right. Right, which means it doesn't mean we're sorry for what we did at all. We're sorry about how you reacted. It's not an apology whatsoever. I wish it was more prevalent. I hope it's more prevalent moving forward. I think the idea of ... I think you still have to have those traditional gateways, putting out a press release, going in front of traditional media, answering questions where there's a journalist and expert who can kind of challenge you. But I think the second part of that is just going on Facebook Live and letting your customers ask questions. One of my favorite social media campaigns I've seen in a long time was for the Moz toolbar relaunch. They basically did Jimmy Kimmel's mean tweets with mean tweets about that product. And they had all the developers reading them off. And they were like, "I wish one day I would wake up and the Moz toolbar would work." They'd be like, "Me too. Me too." But they did that as a, hey, we're relaunching the product. Jay Baer: That was a great one. Bruce Kennedy: Yeah, such a good campaign. Jay Baer: Preempted pain. Yeah. I always feel like if you're doing a Facebook Live and you do it right and it's long enough, and you give people a chance to tune in, from a crisis perspective, you're going to learn a lot about what's really bothering people because you're getting the real time comments coming in. Right? It's almost like a live crisis focus group, which can have its own benefits in addition to the real time ability to communicate your side of the story, you can also see what people are like. No, that's not true. I'm not buying that. And that feedback can be really useful. And it can also be painful. Bruce Kennedy: Right. I never thought about it that way. But you think about the old focus groups where they have the dial on whether they like this person based on what they're saying right then and there. And that's the new age version of that is whether people are liking your live video or if they're commenting angry emojis or whatever else it is. Adam Brown: Bruce Kennedy, social media manager for Cision. I think one thing we can agree on is this darned PR world has changed a little bit from people meters and dials to real time focus groups on Facebook Live. The world has definitely changed. I'm curious. You mentioned a couple times you come from a PR background. Wanted to see if you could share with our listeners a little bit about kind of how you got to this point and that crossover, much like myself, of going from being in the PR world, at least for me being in the PR world, agency wide, then corporate wide, and then as a supplier or vendor wide. You've kind of followed in similar types of footsteps. Could you tell us a little bit about it? Bruce Kennedy: Yeah. When I was living in Chicago, I worked in PR. And I worked with a lot of entertainment clients, and then a lot of technology clients, so everyone from Redbull, Disney on Ice, Monster Jam, Medieval Times on the entertainment side. And then on the tech side, I worked with Tech Week Chicago, a company called [Octa 00:31:17], Datascope. And on the tech side of things, my job kind of evolved into more content marketing than it was PR. The strategy that we kind of used is we would outline content ideas, then author them. And then we would pitch them as story ideas. If they didn't land, then they would live on the blog. As I got more into the content side of things, I kind of naturally got more into content distribution. Started doing more social media for clients, started getting more involved in the analytics that comes with that. And then so when Cision, our sort of PR analytics provider, had an opening for a social media manager, it was kind of a natural progression. Jay Baer: Jump to the vendor. I love it. It's a fantastic career path. Jay Baer: Look. You can play with this tool all the time for money. Bruce Kennedy: There was a kind of funny story about that. During that whole transition when I was looking at being more data oriented, my first step wasn't to jump ship. It was actually to try to upgrade our Cision package so that we had more insights and analytics. And when we didn't get around to that, I kind of wandered over to the career section of the website, so that's kind of how I ended up there as well. Jay Baer: That's awesome. I love that. Adam, was that how you joined SalesForce? Adam Brown: In a way, yeah. I was a customer before. I feel like that Remington micro screen razor guy who liked the company so much that we bought it. I certainly did not buy SalesForce, but joined SalesForce because I was like, "This area and this space is transforming." Like you've said, Bruce, so quickly, the world of public relations is changing at a crazy rapid pace. And the idea of who a PR practitioner is, is changing, and the idea of who that journalist or that, if we call it a carrier pigeon if you will, that connection between us and the end audience is changing too. It's a neat time to be doing what we're doing. Right, Jay? Jay Baer: It's the best time to be doing what we're doing. The good news is, it changes all the time. The bad news is the same. Right? We'll take it. I guess we'll take it. Bruce, why don't you give us one tip? This is a question we ask every guest. The one tip for people who are looking to become a social pro, what would you tell them? Bruce Kennedy: I think the best thing you can do is get out there and start doing the work. There's a lot of content out there. There's a lot of great blogs. Buffer has a great blog for social media. Bruce Kennedy: Convince & Convert has a great blog. Bruce Kennedy: So there's a lot of resources, but until you actually start doing the work, you can listen to as many Facebook ad webinars as you want when you actually get into the platform, unless you've played around with it for hours and hours and hours on end, you're not going to know what to do. My best advice would just be to find a way, whether that's through a freelance gig, or stepping up at your company and volunteering to help create social media content, because it's an interesting field. There's not, I'm sure there are now, social media degrees, or as much of a ... Like you said, Jay, it's changing all the time. Even reading a guide on how to do something from six months ago might be totally irrelevant now. Jay Baer: Yeah. Definitely. Think about Instagram. Just in the last, since Adam and I did a show together, Instagram TV came out and we talked about it on the show recently with Jen Herman. But Instagram was important, but it wasn't that long ago it didn't exist at all. And now it's a big part of people's social strategy. You've got three different strategies as we talked about on the show. You have to have a regular posting strategy. You have to have a live story strategy. And now you have to have a live TV strategy. It's like, whoa, that wasn't a thing. So if you wrote a book about social that said, "Here's what you need to do," and Instagram wasn't part of that, then now what? It's time to get another book. Bruce Kennedy: Right. And just being aware of those opportunities is such a big thing because if you're behind on a particular platform, you don't know Instagram stories for example, you could be in a brainstorm meeting where Instagram stories is the exact piece of content you need to bridge that gap. And you're just kind of handicapping yourself by not being up to date with it. Jay Baer: Last question for you, Bruce Kennedy, head of social media for Cision. If you could do a Zoom video call with any living person, who would it be and why? Bruce Kennedy: Any living person, I'm going to go with Dave Chappelle. Jay Baer: Oh, good answer. Adam, I'm pretty sure that's our first Dave Chappelle. Adam Brown: I'm surprised at that fact. Adam Brown: Bravo, Bruce. Tell us more. Bruce Kennedy: Yeah. Well, I have a huge love of standup. I do some standup. Dave Chappelle, I think, should be studied in communication classes for the rest of forever, the foreseeable future, because if you watch some of his standup and his specials, I think he has a way of cutting through an issue, especially with his more recent stuff. He seems to be immune from the sort of backlash that a lot of comedians get for jokes nowadays that aren't PC, or upset somebody. But Dave has such a clever way to cut to the heart of an issue immediately. And you appreciate the observation itself so much that even if you feel like it's an uncomfortable subject, or it's a little bit off putting, just the way he's able to communicate on stage I'm such a fan of. And I'd love to talk to him about his create process. Jay Baer: All right. We have our work cut out for us. Dave is not one to do a lot of media, but we'll see. Chappelle on Social Pros would be probably our highest rated episode, Adam. Adam Brown: I would think so. Jay Baer: I think we can do it. What we need to do is use a tool like Cision to see what reporters have covered Dave, because they'll know him. And then we'll see what happens. We'll work backwards. We'll connect the dots. Bruce Kennedy: Right. We'll make it happen. Jay Baer: Let's do it. Let's do it. You should get him to speak at your conference, Adam. Or Bruce, you guys do an event. Get Chappelle. Adam Brown: Chappelle at Dreamforce. I like it. Jay Baer: Yes, also true. Yeah. Why isn't Chappelle at Dreamforce? Adam is smirking on the video. You guys can't see this, but I wonder if Chappelle is actually booked for Dreamforce and he's just not telling us. Bruce Kennedy: I'm going to have to get tickets. Jay Baer: Is that true? Jay Baer: You should get tickets for Dreamforce anyway, Bruce. So should everybody. Bruce, thank you so much for your time. Thanks for the great work that you're doing at Cision. Folks, if you haven't spent much time kicking around the Cision coms cloud, definitely do it because, as we said, it's an amalgamation of a bunch of great stuff that you can put into practice to make you a better communicator and a more measured communicator as well. The insights and the data stuff is pretty rad. Bruce, thanks so much. And to everybody out there, thanks as always for listening to us at Social Pros. We are delighted to have you each and every week. Don't forget that every single transcript, every episode of this show dating back almost nine years now, before there was an Instagram, before there was Instagram, is online at socialpros.com. So tune in there, and we will catch you next week for another episode of Social Pros.